Peris is a part of the 2018 graduating class at Uhuru Academy. She is from a very traditional tribe known as the Masaai. Peris loves her traditions and feels that they make her unique. For example, she loves the traditional songs, and has removed her bottom two teeth because her community believes it is a blessing of good health. However, she also knows that she doesn’t want to follow some of the traditions. For example, her sister was married very young and didn’t go to high school. Peris wants to be a nurse when she grows up, in order to treat people from her village and help the country. She loves the education at Uhuru Academy and appreciates that there is no bullying. She knows that education will help her to gain knowledge and equip her to help others. 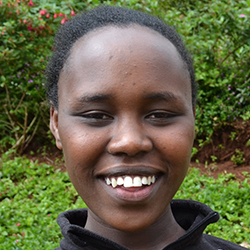 Click here to sponsor a student like Peris.